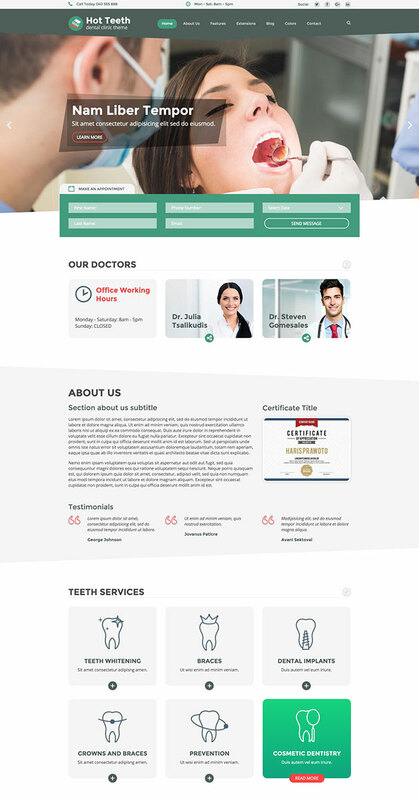 Dentist Joomla template Hot Teeth is a responsive Joomla template dedicated to dentists and all businesses that offer dental services. 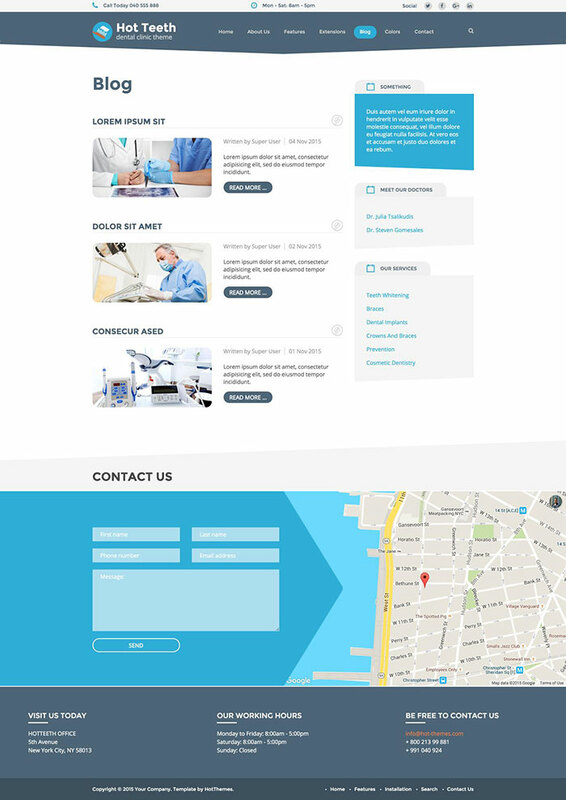 Dentist Joomla template includes a long home page with many elements appropriate for such kind of websites. Dental clinics are usually private businesses. Therefore, a strong web presence and marketing are key factors for successful promotion of such businesses. 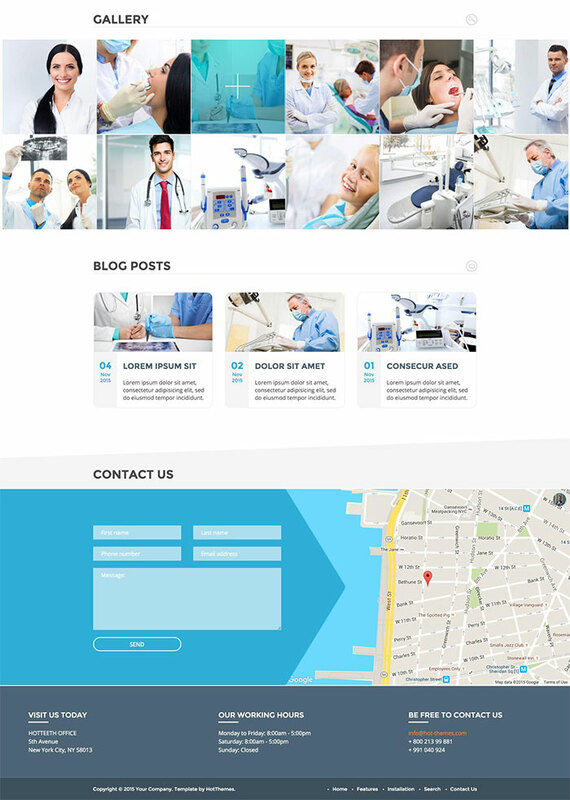 Running a blog about dental services will bring a lot of new visitors to the clinic's website. All of them are potential customers. 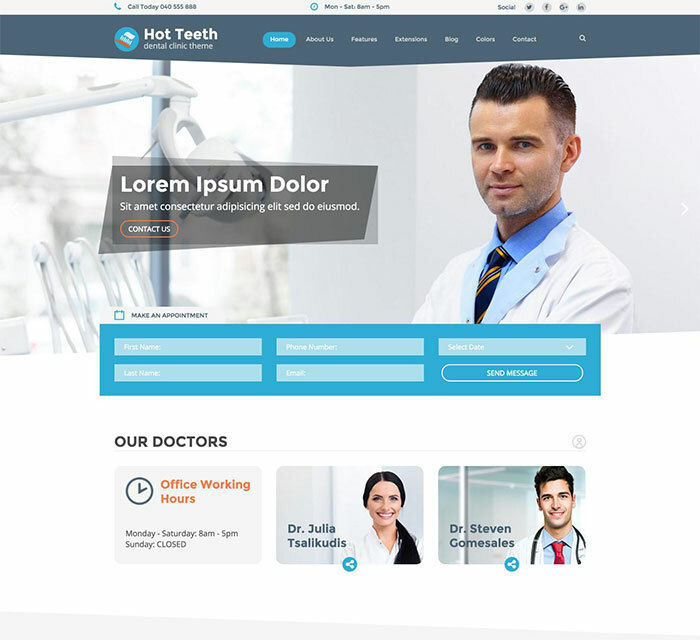 Hot Teeth is a Dentist Joomla template that incorporates all those features necessary for a successful website. Visitors of the website will be able to learn about clinic's location, doctors, working time, offered services, etc. Also, visitors can easily schedule an appointment. 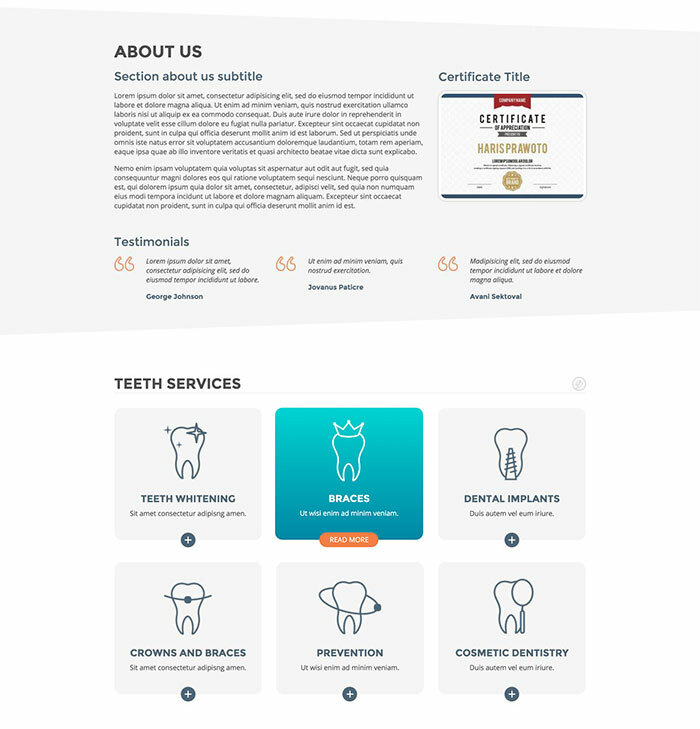 Technically speaking, the Dentist Joomla template is the most sophisticated template we developed so far. This is the first template based on the latest Sparky Framework v2.2, so we honestly recommend you to try it. The template includes some modern elements, such as vector SVG graphic and CSS3 animation effects incorporated in the carousel module. The sloping lines that you can see throughout the template are 100% based on CSS. 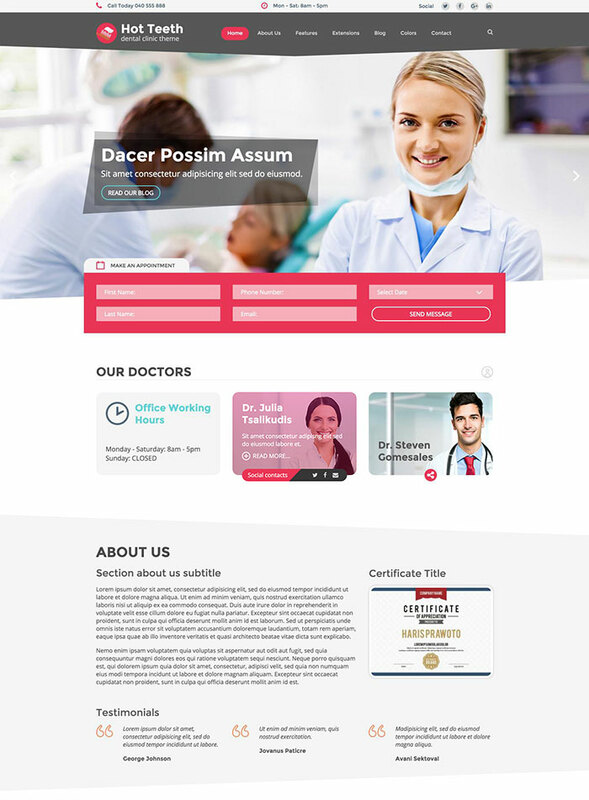 Therefore, it's not necessary to edit all your images to achieve this effect, because the effect would applied automatically by the Dentist Joomla template. We included several responsive Joomla modules with this template. Hot Swipe Carousel (with some improved CSS3 powered animations), Hot Slicebox, Hot Responsive Lightbox (with special hover effects) and Hot Maps v2.0 module. All these modules are included with this template without additional fees (you save $15 per commercial module). 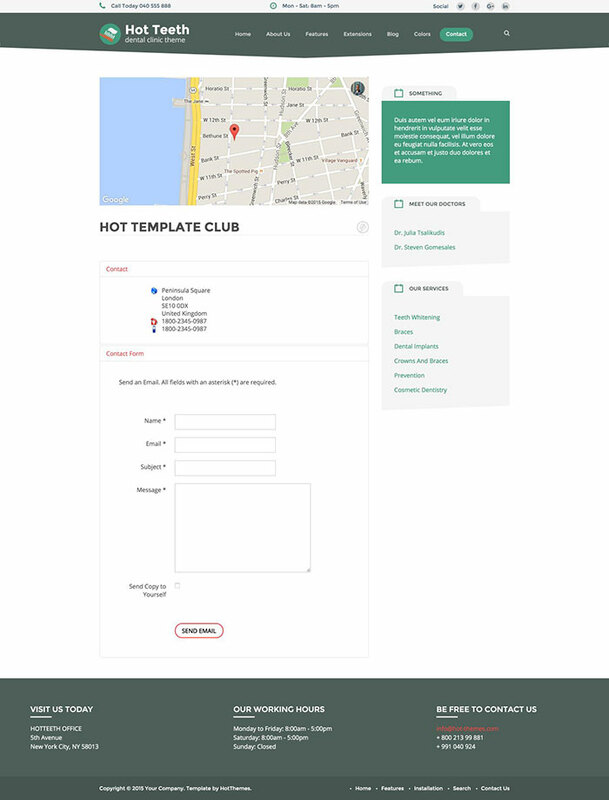 There are also two modules for contact forms (Hot Appointment and Rapid Contact). All extensions are styled and configured for this template. Total control of all menus through the framework. You can set functionalities and style of all your menus and drop them directly into the layout. Top menu with drop-down sub-levels is included. Two top menus are joined and converted to a button for easier navigation on the mobile devices.